Our weather was absolutely awesome this last weekend. The blue skies and warm tropical breezes were incredible and we spent every possible minute outdoors. This of course led to dining al fresco on our deck where we celebrated the beginning of summer vacation with a luau brunch. Since my husband is from Hawaii, things Hawaiian tend to occur in our life fairly often. 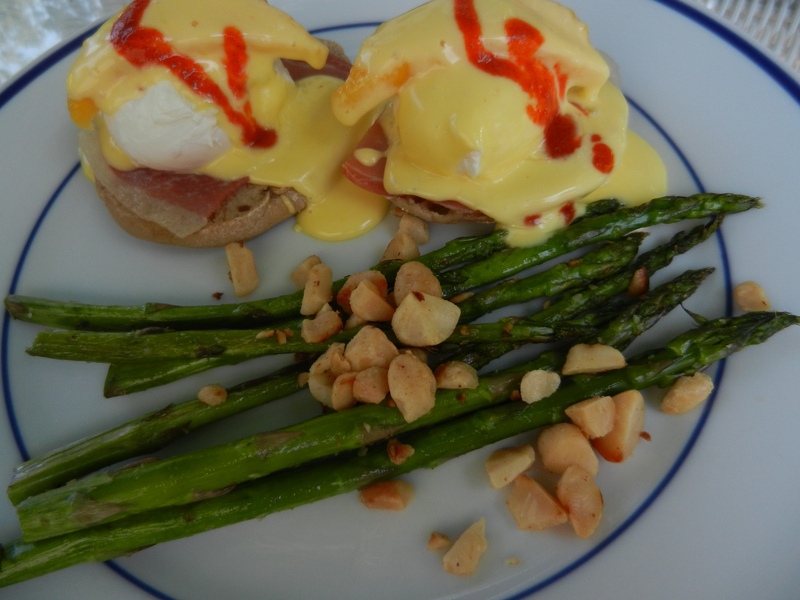 Better than Eggs Benedict with Hawaiianaise Sauce! Tropical fruit and macadamia nuts are obvious island choices for a Hawaiian menu. Pork is also extremely popular there, as are all things coconut including coconut oil. 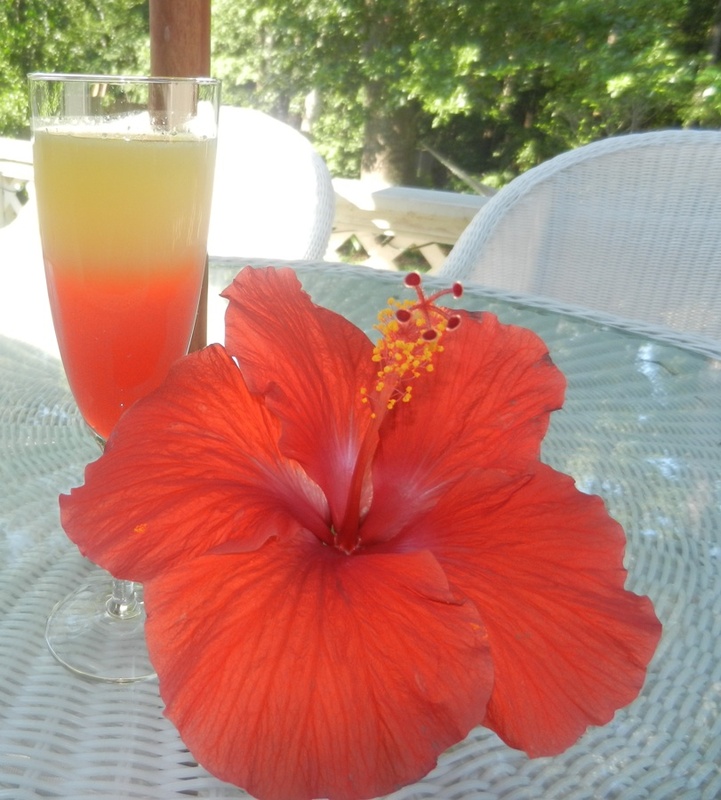 I pulled out one of our brunch favorite recipes: Eggs Benedict and decided that tropical is better than traditional. 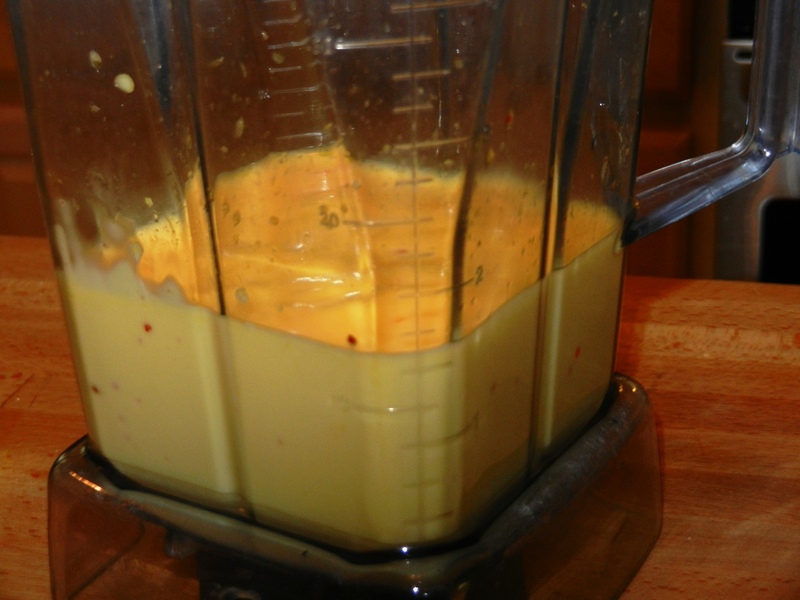 I revamped the Hollandaise sauce by using coconut oil instead of butter, making it far more healthy. The natural antibacterial properties of coconut oil help make the sauce a little safer since we are working with uncooked eggs. The slight hint of coconut flavor was absolutely delicious and so fabulous that my friend Mike (who is a genius!) re-named it Hawaiianaise. Trust me, you’re going to love it! It would be incredibly delicious not only for saucing up Eggs Kamehameha…you could also pour a little over grilled chicken or fish or with rice and steamed shrimp. So, invite your friends over, whip up this recipe, cut some fresh fruit, and pour a few fruity drinks. Enjoy life outdoors before it gets too hot. Any excuse for a luau is a good one! Preheat oven to 350°F. Heat a large pot of water (fill to a depth of 4”) with lid on, and bring it to boil. 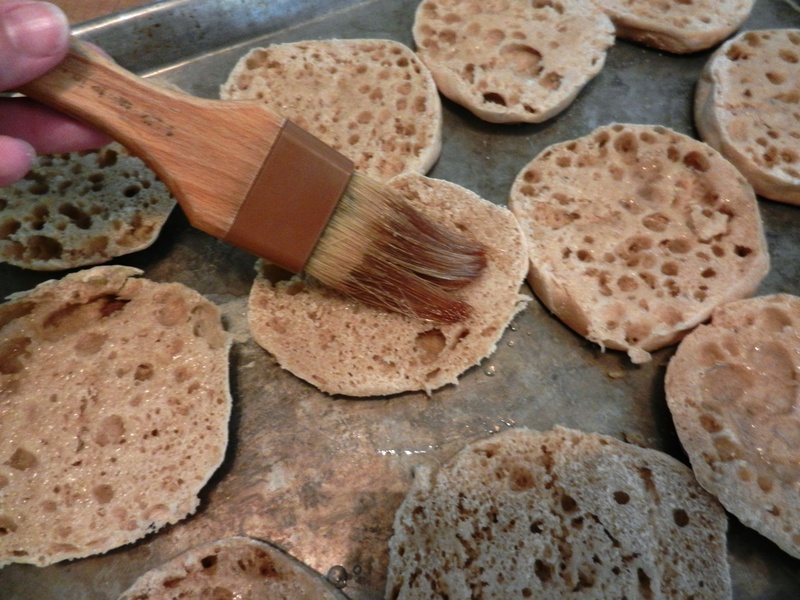 Split open English muffins and spread on a baking sheet, cut side up. Brush the tops with coconut oil and place in the oven until lightly toasted. Remove from oven; turn oven off. 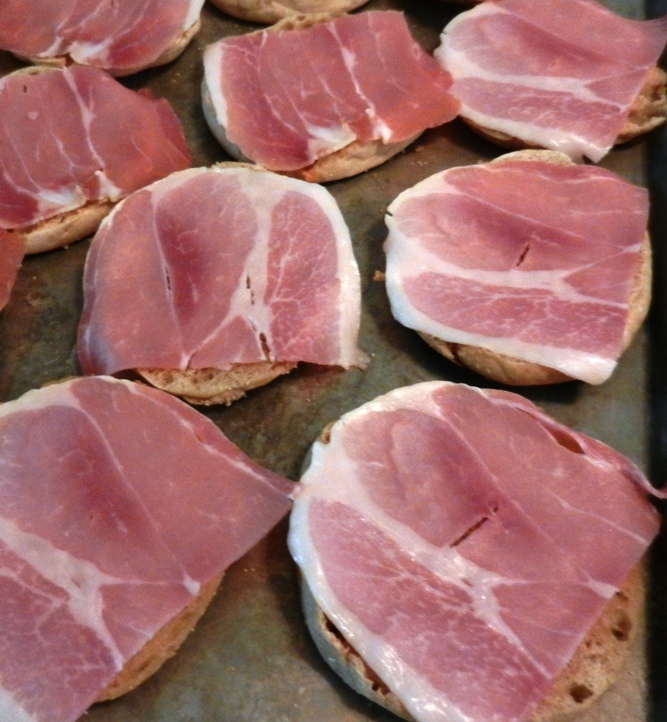 Place a piece of ham on each muffin half and return to the oven. Add the remaining teaspoon of salt and white vinegar to the boiling pot of water. Crack one egg into a teacup. Stir the pot of boiling water clockwise to create a steady current and carefully pour the egg into the center. Repeat process with each egg; be careful that they do not cook together. Remove each egg with a slotted spoon when they are cooked to the preferred level of doneness. 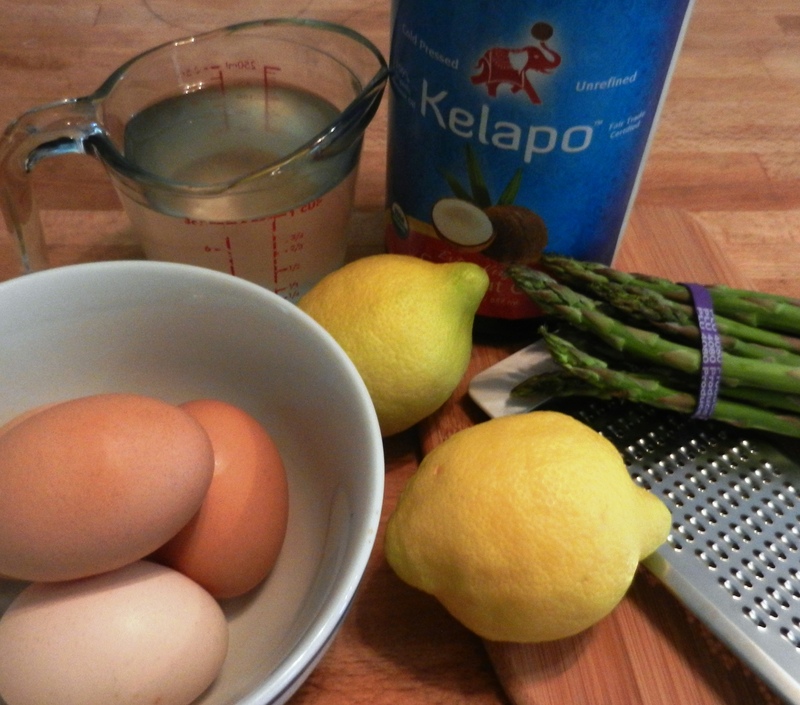 As the eggs cook, quickly saute the asparagus. 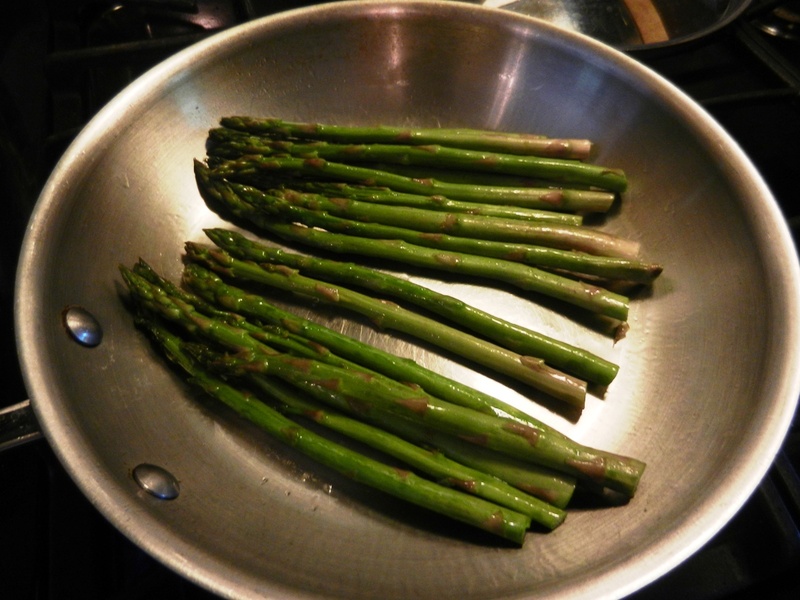 Heat 1 tsp coconut oil over medium high heat, add the rinsed and trimmed asparagus stalks and saute until just tender. Add macadamia nuts, turn off heat and leave all in a hot pan on the burner to toast slightly as you finish preparing the other dishes, stirring occasionally. Remove the toasted muffins from the oven and arrange them on a serving platter. Place a poached egg on each prepared muffin half, top with a slice of mango and about 2 TBSP of the Hawaiianaise sauce. If desired garnish with a little sriracha. Serve with the asparagus. Serves 4, though you may wish you had more! *Soft or undercooked eggs do pose a possible health risk due to the possibility of salmonella. When using recipes that call for these ingredients, use the best possible eggs to reduce the risk of contamination. If your health is compromised, you may prefer to purchase pasteurized eggs, to cook the eggs more, or in the case of sauces, to heat them in a double boiler while stirring continuously.